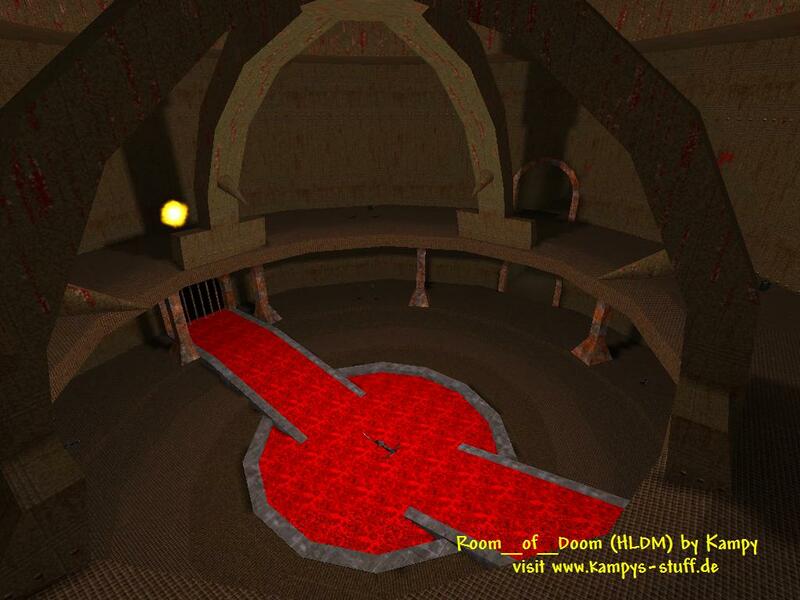 This is an arena type map with a quake or doom look. It had been a map of the "Operation A.M.O.K." mod which was canceled some time ago. I took the 85% ready map and completed it for Half-Life Deathmatch now. The architecture of the map is very complicated. The whole map is round and doesnt have a straight floor which was very hard to build with the HL engine. The R_speeds are a little high because of that ( 900). The gameplay is typical arena gameplay, you start grab a weapon and shoot into the middle of the arena. This is great fun and there's another cool feature of the map: at one side of the arena there's a wooden cross which you can turn around by using it. This causes a great explosion which kills everybody on the whole map. The only way to survive this explosion is to step into one of the teleporters and beam on the top of the arena. Then you have to crouch in the middle of it so you wont be caught by the explosion. 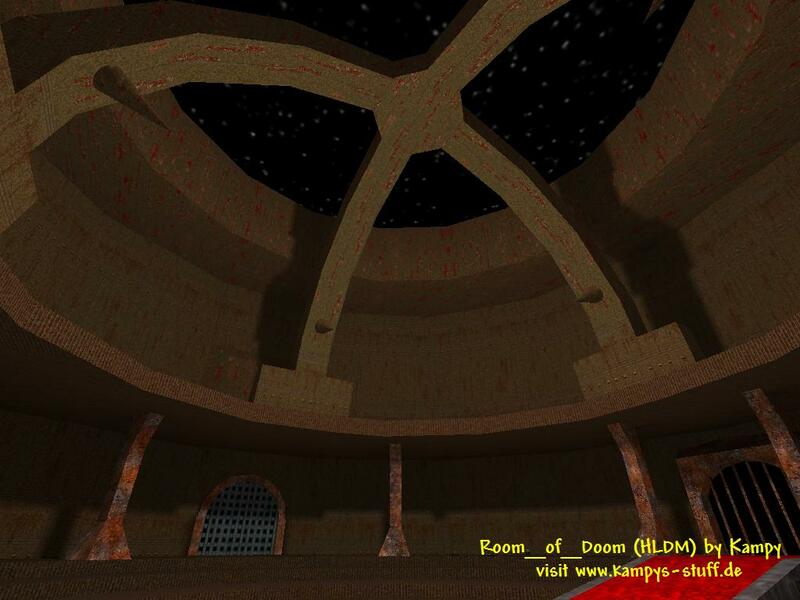 Basically Room_of_Doom is one big cylinder room with 2 floors and a small position at the top of it. To get into the second floor you have to go through a small corridor where you can find some goodies. The teleporters are on the second floor. Both teleport you into the main teleporter room where you can choose if you want to go on the top of the arena or in the middle of it at the bottom. The itemplacement is like this: there are machine guns and shotguns next to each other placed at the starting points inside the arena hall. In the middle at the bottom there is the crossbow and in the corridor you find Colts, health, a battery and the longjump. Find ammunition in the teleporter room and the bazooka at the top of the arena. 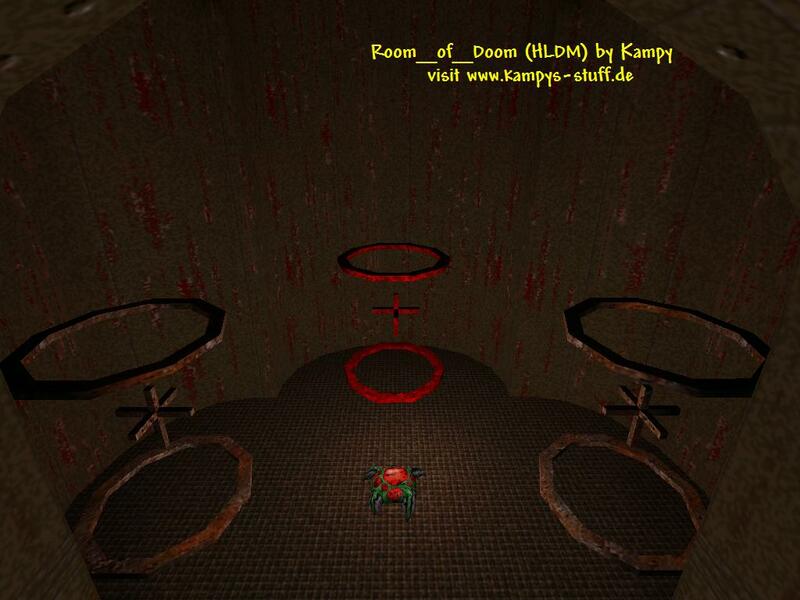 All weapons are regulary used in room_of_doom. Its a good choice to hide at the first floor with the crossbow, but if you do you are likely to die when someone turns the cross. All in all a cool arena map with lots of different weapons used and great for arena deathmatch or adrenaline gamers. - camping with the crossbow on the first floor is effective, but if someone activates the explosion you have little chance to survive.